Prepare for nostalgic awakenings as you spend a day in the storybook Boston Public Gardens and the city’s historic heart, Beacon Hill. It’s nearly impossible not to begin to feel imbued with the grace and quaint character of this great American city. Begin your day with a visit to the Boston Gardens, the first public botanical garden in the United States. Any season will give you the feeling you are standing in the middle of a painting that you might have noticed in a gallery while walking down Newbury Street, or that you might even find in the city’s Museum of Fine Arts. In the spring, you’ll find the gardens in all their glory, brimming with a certain narcissistic delight. Enter the grounds at their main entrance where Commonwealth Avenue ends at Arlington Street and you’ll be astounded by the brilliance of hundreds of tulips lining the pathway toward the statue of a valiant George Washington. Looming high above the tulip patch, he reins his stallion against the skyline of downtown Boston. Stroll among the variety of floral specimen and join Bostonians in appreciation of their treasured gardens. Venture to the northeast corner where you’ll find a sculpture of the Mallard family of ducks from Robert McCloskey’s famous children’s book, Make Way for the Ducklings, the official children’s book for the Commonwealth of Massachusetts. Walk around the lovely Frog Pond and you’re likely to find a live Mallard family scurrying to keep up with mom. If you’re anxious to join them, hop aboard a “swan boat” and let a tour guide paddle you around the pond in this timeless Boston activity. In the winter, when the pond is frozen and the swan boats stored away, the Frog pond becomes the venue of another traditional Boston activity. Grab a pair of ice skates and execute figure eights while the downtown cityscape surrounds you. In the warm weather, you’re sure to find a painter somewhere standing behind his or her easel, or one of many a bench or patch of grass taken by a reader of philosophy or literature, and you might even hear someone playing an instrument or singing opera in the distance. Have a picnic or just take a rest under one of the large weeping willows to take in this timeless picturesque atmosphere. 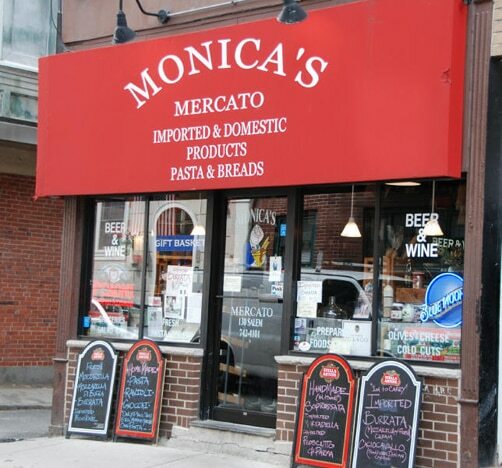 For picnic supplies, DeLuca’s Market offers gourmet groceries, wine and cheese. If you’re suddenly in the mood to dive into a good book, Commonwealth Books can be found on the south side of the gardens and features a scholarly selection of used, antiquarian and out-of-print books. Exit the gardens at the northwest corner, cross over Beacon Street and arrive on Charles Street, the main drag of Beacon Hill. This quintessential historic Boston neighborhood, offers some of the city’s most expensive real estate including the location of the home of Senator John Kerry. Start by grabbing a coffee or an Italian treat from Café Bella Vita. The delicious gelatos are as good as the ones found in the North End! Then make your way down the drag checking out the slew of antique stores, upscale gift shops, groceries and boutiques inspired by the lifestyles of “old money” Bostonians. Eugene Galleries is an exciting find for history buffs, featuring antique maps from all over the world, as well as other memorabilia and antiquarian books. Speaking of history, if you’re in the mood for some shopping, but not willing to put a dent in your funds at a fancy boutique, take a peak in Second Time Around, one location in a chain of consignment boutiques found around the city and where you may be able to find some great designer clothes in decent condition. After you’ve had your fill of shopping or browsing, consider turning east somewhere along Charles Street, and venture on a walk around the residential section of the neighborhood. In these narrow back streets you’ll instantly escape the din of the main drag and find yourself surrounded by quiet and cobblestone amid the rows of luxurious 19th century homes. 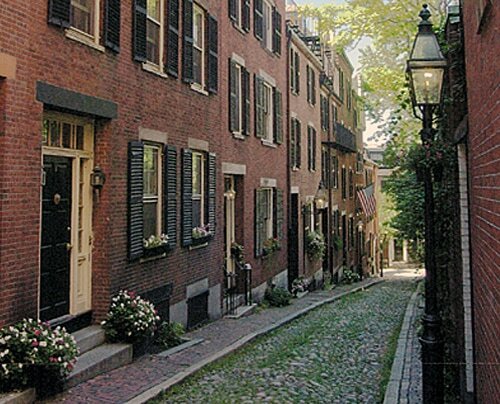 Take a few moments to transport yourself back to 19th century Boston, where anyone who was anyone aspired to live in this secluded, well-to-do portion of the city. The neighborhood is also quite a thigh-burner, spanning the steep streets of a not-so-gently sloping Beacon Hill. Soon you’ll find yourself wondering how horse-drawn carriages possibly made their way around. As the sun goes down and the gaslights come on, you may be ready for some dinner and refreshments. A great neighborhood nook to duck into is 75 Chestnut, which can be found by making a right off Charles Street about a block before it meets with Beacon Street. Stepping into the warm mahogany interior of this restaurant and bar tucked in among more of the neighborhood’s lovely brownstones may be the closest you come to feeling like you’re entering a Beacon Hill home. Grab a table by the window to enjoy a glass of wine or a martini, or sit down to a dinner of contemporary American cuisine. If you have children along, it’s probably best to try a larger restaurant on Charles Street, such as Ristorante Toscano, or, for some gourmet pizza, Figs. When night falls, head back out to Beacon Street and walk off your dinner in the Boston Commons, adjacent to the gardens’ east side. Steeped in Boston’s history, you’re now ready to indulge in the city’s present by embarking on the nightlife in the theater district or Faneuil Hall. Kelly Egan is a recent college graduate. She is a scholar of languages and literature and an aspiring poet, journalist and traveler. She currently lives in New Jersey.